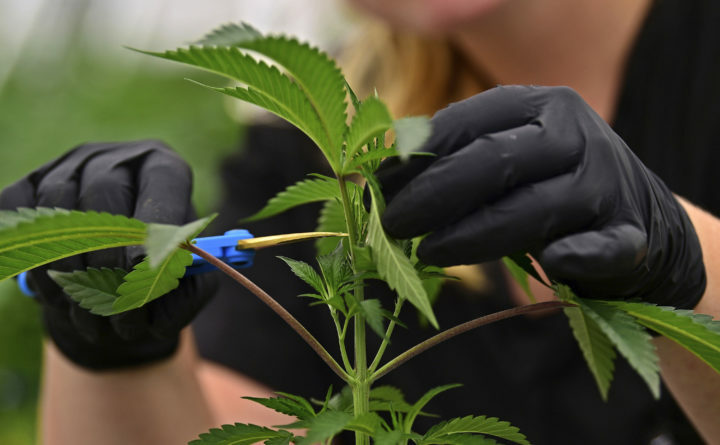 In this Sept. 20, 2018, file photo, an employee at a medical marijuana cultivator works on topping a marijuana plant, in Eastlake, Ohio. A proposed change to Bangor’s development rules would open up an industrial area just south of Interstate 395 to facilities that produce or sell marijuana by allowing interstate highways to serve as a buffer between the marijuana facilities and protected facilities such as schools and parks. Right now, the city’s development rules prohibit marijuana facilities — whether stores or facilities for testing or cultivation — from opening within 1,000 feet of schools, orphanages, youth shelters, and public parks and playgrounds. Marijuana stores and cultivation facilities also cannot be within 300 feet of homes, day cares and places of worship. Now, city officials are considering creating an exemption from those setback requirements if there is, alternatively, an interstate highway between the proposed marijuana facility and the protected property. They started considering that exemption after an individual proposed opening a marijuana cultivation facility in the industrial area along Perry Road, which runs along the south edge of Interstate 395, according to Paul Nicklas, the assistant city solicitor, who has discussed the proposed change at two recent meetings. That proposed facility technically would not meet the city’s setback requirements, as it would be within 1,000 feet of the Bangor Municipal Golf Course, Nicklas said at a Jan. 15 meeting of the Bangor Planning Board. The golf course is classified as a park under the system’s land use rules. But the proposed cultivation facility would be separated from the golf course by Interstate 395, and that separation seemed to meet the intent of the town’s setback rules, Nicklas told the planning board. Interstate 95 also passes through Bangor, but given land use rules around the rest of the city, the practical effect of the proposed change could be limited. If the city does allow interstate highways to serve as a buffer from marijuana facilities, that industrial zone to the south of Interstate 395 is probably the only area that would be affected, Nicklas told the planning board. Nicklas did not immediately respond to a voicemail left late Friday afternoon. It is not clear how much of that industrial area would be newly eligible for the opening of marijuana facilities if the city passed the proposed rule change. Nicklas also did not identify the person who proposed the new facility or what the facility would do. Under the city’s codes, the term “cultivation facility” can apply to those that produce either medical or recreational marijuana. Other entities that are now located in the industrial zone along Perry Road include the Cole Land Transportation Museum, P.R.C. Industrial Supply and N.H. Bragg — which was recently acquired by Horizon Solutions of Rochester, New York. There’s also a daycare in that area, Little Angels Daycare and Preschool on Perry Road, to which the 300-foot setback requirement would likely apply. The planning board unanimously voted to support the proposed change, which means it now needs City Council approval to take effect. The group’s next regularly scheduled meeting is Jan. 28. Members of the city council also weighed in on the proposed changes during a Jan. 8 meeting of its business and economic development subcommittee. The committee voted 4-1 to send the proposal forward. Councilor Gibran Graham opposed the change, arguing that it could reduce the number of potential locations that non-marijuana businesses or institutions consider when locating in Bangor. Councilor Gretchen Schaefer supported the proposal, but noted a popular bike route goes through much of the industrial area in question. In response, City Manager Cathy Conlow said that local rules would require that any cultivation happen indoors. Councilor Clare Davitt said she would be more concerned if a marijuana retail store were being proposed in that area, while Councilor David Nealley said he feels comfortable with rules the city has already passed to ensure that marijuana facilities are secure.